Dig into RapidWeaver theme resources. Is there a better alternative to RWThemeMiner? Is RWThemeMiner really the best app in Editors category? Will RWThemeMiner work good on macOS 10.13.4? 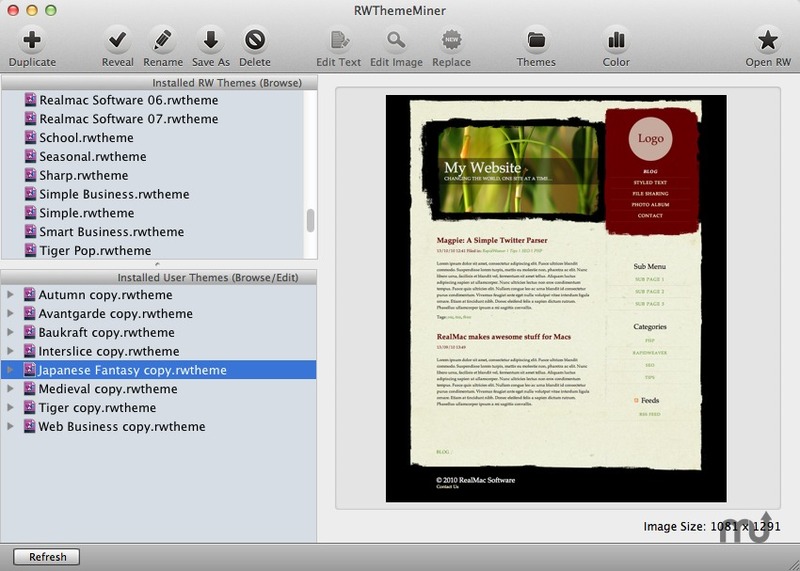 RWThemeMiner is a RapidWeaver theme editing assistant. It enables users to edit or replace any element in any RapidWeaver theme. It provides a user-friendly interface between the contents of RW themes and selected image and text editor applications. With RWThemeMiner making theme modification is easy and intuitive. RWThemeMiner assits in editing or replacing theme image files as well as editing text files such as: css, html, js, plist, etc.. Reveal any selected item in the finder. Replace or edit theme images. RWThemeMiner needs a rating. Be the first to rate this app and get the discussion started!